The Turtles sneak into an arcade in the middle of the night to play video games. 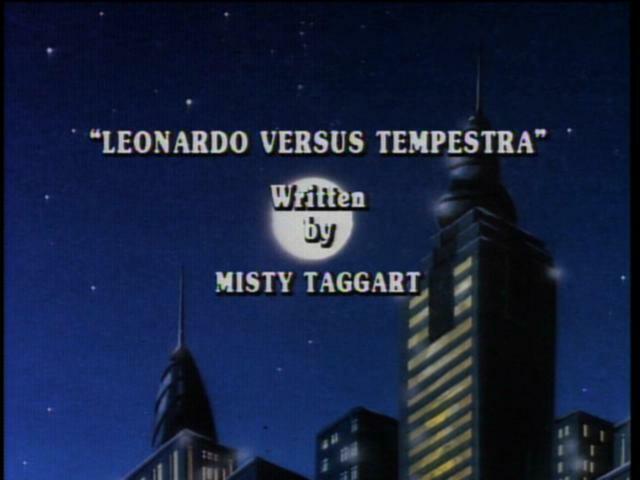 Leonardo gets hooked on a game called “Tempestra’s Revenge.” One rainy night, Leon sneaks out to play the game. While Leonardo is playing the game, lightning strikes the arcade and Tempestra comes to life. Leonardo contacts the other Turtles and asks them for help. Tempestra overhears him calling for help and traps the other Turtles in their lair by flooding the sewers. April finds Leonardo trying to dodge falling things from the earthquake that Tempestra has started. The fearless reporter picks up the dazed Ninaj Turtle and they both set out to find Tempestra. They follow her trail to a nuclear power plant where she has gone to recharge herself. Leonardo thinks he has an idea to get rid of Tempestra for good. He tries to egg her on by telling her he does not think she is all that powerful. Tempestra falls for the trick and proves her strength by creating three creatures to fight Leonardo. Meanwhile, in the Turtle lair, Donatello has created a machine to help the remaining TMNT escape the flooded sewer so that they can help Leonardo and April. Don, Mike and Raph make their escape and manage to track down April and Leo. The three TMNT arrive at the power plant just as Tempestra releases her creatures upon Leonardo. With all the Turtles reunited, they defeat Tempestras creatures with ease. Tempestra realizes that she has been tricked and tries to blow up the nuclear generator to get more power. 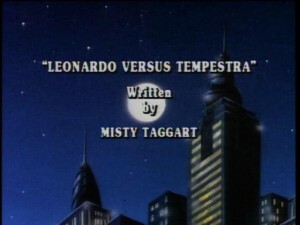 Leonardo uses the computer chip from the video game against Tempestra to capture her once again. After this adventure, Leonardo decides to lay off video games for a while.